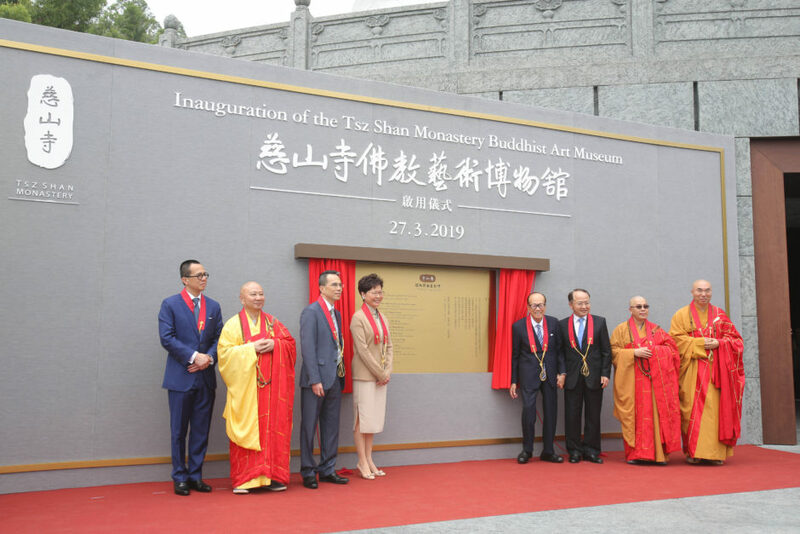 (27 March 2019) Today the Tsz Shan Monastery announced that its Buddhist Art Museum will welcome visitors with free general admissions to pre-registered visitors from 1 May 2019. Its permanent collection aims to tell the story of Buddhism and how it survives its environment as it moved through the course of history. Tsz Shan Monastery and its Buddhist Art Museum serve as a centre of Buddhist research and studies for those who seek transcendence and spiritual realisations through Buddha’s teachings of Clarity, Compassion and Action. The Abbot of Tsz Shan Monastery, Venerable Dr Thong Hong, in his welcoming speech emphasised that the combination of inspiring architectural, historical collection and service programmes in Tsz Shan Monastery created an immersive environment for reflection and for the development of spiritual care and counselling to the community. Venerable Dr Thong Hong said, “Home is where the Heart is”, which is a fitting analogy of the mission of Tsz Shan Monastery to promulgate the teachings and create benefits for all sentient beings through education, promotion of the arts and services to the community. 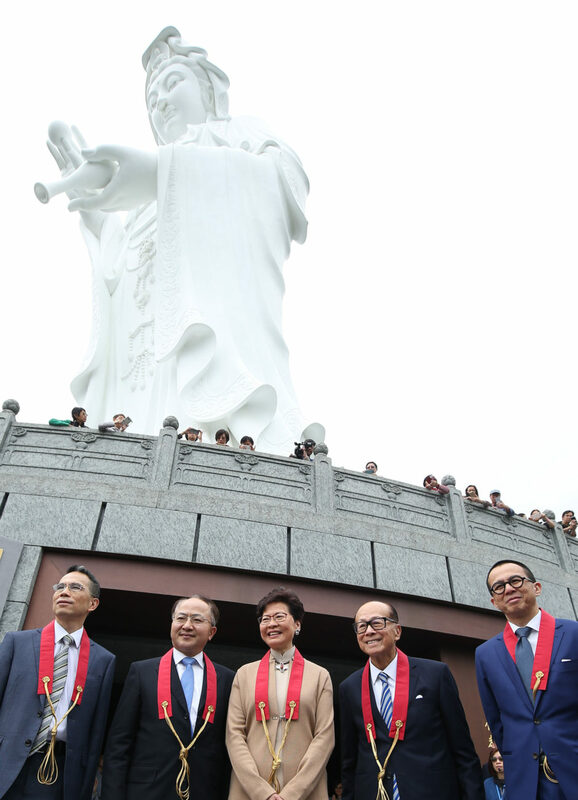 He also thanked Mr Li Ka-shing for his dedication to the advancement of Buddhist philosophy and his unrelenting resolve inspired many likeminded individuals to further the cause of Tsz Shan Monastery. 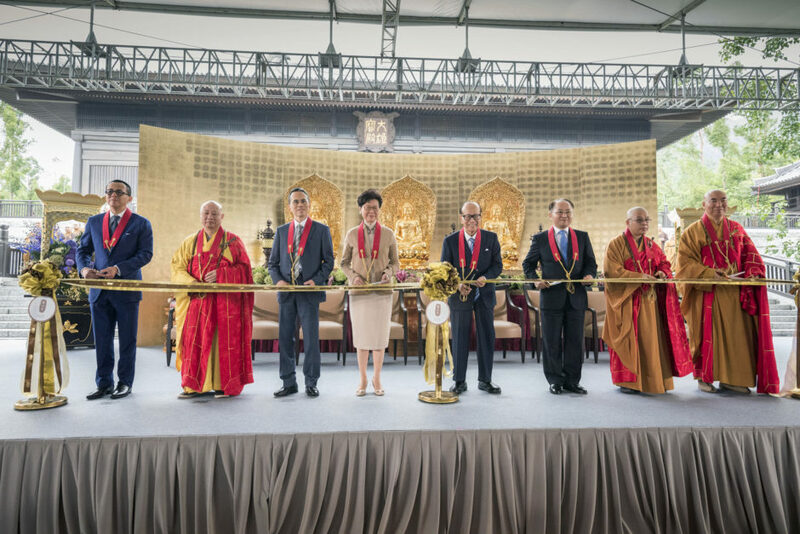 Over 2,000 guests gathered to attend the ceremony, amongst whom some 600 are volunteers who have given staunch support to Tsz Shan Monastery. 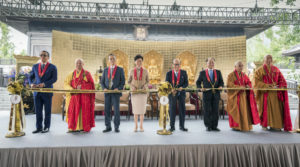 Officiating guests included Abbot Venerable Dr Thong Hong, Hong Kong SAR Chief Executive Mrs Carrie Lam, benefactor of the Monastery and Chairman of Li Ka Shing Foundation Mr Li Ka-shing, Director of Liaison Office of the Central People’s Government in the Hong Kong SAR Mr Wang Zhimin, Deputy President of The Buddhist Association of China Venerable Ming Sheng, President of The Hong Kong Buddhist Association Venerable Kuan Yun, Chairman of the Board of Tsz Shan Monastery Mr Victor T K Li and Deputy Chairman Mr Richard Li. 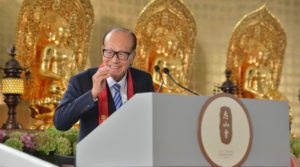 In his speech, Mr Li Ka-shing specially thanked those with different values and beliefs for their dedication and support for the mission of Tsz Shan Monastery. He highlighted that the professional ideals they personify was paraphrased in the Eightfold Path – Right View, Right Intention, Right Action, Right Speech, Right Livelihood, Right Effort, Right Mindfulness and Right Concentration. Such professionalism is the emblematic modus vivendi of Hong Kong and forever the sinew of our Hong Kong story. Quoting his favorite Dharma teachings in the Diamond Sutra that posit all phenomena are like a dream, an illusion, a bubble, a phantom, Mr Li believes that grasping the world beyond the immediate happenings of daily life is an art and we all need to find answers to the bold and hard questions “Who am I? What should I do with my life?” and most importantly “In what direction should we move forward and thrive together?” The future, whatever it might be – is defined by our purposeful trajectory of wisdom, compassion and undertakings. He hopes Tsz Shan Monastery can be a space for such quiet contemplation and orientations. 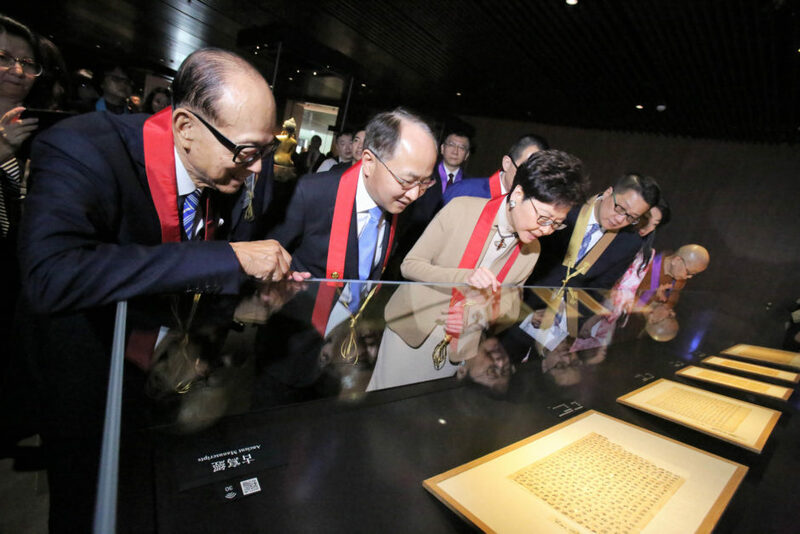 The fund for land acquisition, planning and construction of Tsz Shan Monastery and Buddhist Art Museum, and the endowment for operation costs are all donated by The Li Ka Shing Foundation. To date, cumulated total has reached HK$3 billion. The initiation for Tsz Shan Monastery? We all have a precious mani pearl deep in our minds, long obscured by dust and toil; now when the dust is gone and its light shines forth, a myriad of illuminations blossom across our mountains and rivers. This illumination will inspire us and we, in turn, will be an inspiration to the world. He is committed to establishing a Buddhist temple and an institute of Buddhist studies to advance the understanding of Buddha’s wisdom, philosophy and teachings. Since its opening in 2015, the monastery has welcomed near one million visits. How did Mr Li come up with the idea of building a Buddhist Art Museum? 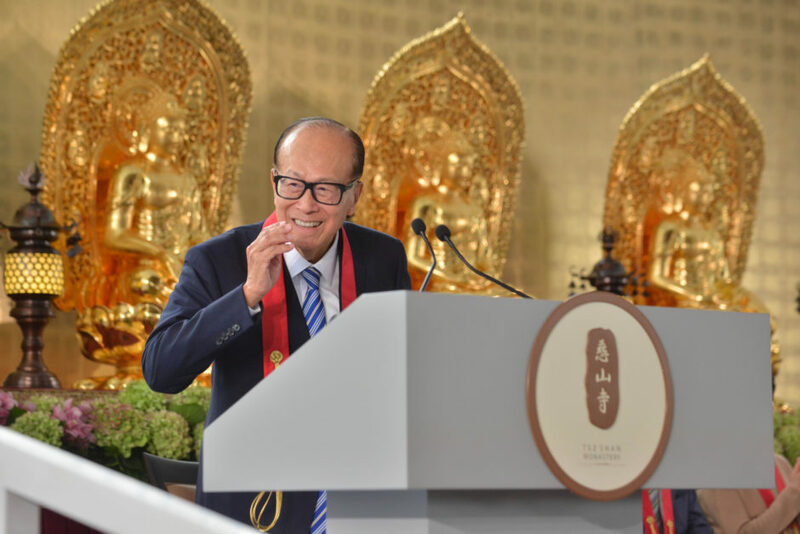 Mr Li Ka-shing believes that Buddhism is a philosophy for everyone, and the Museum in Tsz Shan Monastery aims to tell the story of Buddhism and how it survives its environment as it moves through the course of history. Many of the exhibits housed show the beautiful transcendence smile of the Buddha, yet behind this smile is the story of human dedication and suffering. The Museum aims to embody and express the life and teachings of Buddhism through its collection, and enriches those who seek transcendence and spiritual realisations with an opportunity to explore beyond the symbolism and the art for the essence of the Buddhism. 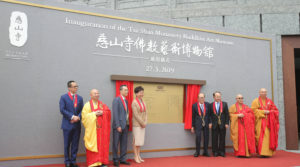 It took three years to plan and build the Museum, but since the start of its construction more than 10 years ago, Mr Li also developed the idea of building an art museum to promulgate Buddha’s teachings. What is the area of the Buddhist Art Museum? How big is its collection? 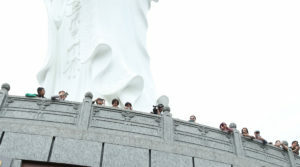 The base area of the Guan Yi statute is 24,000 square feet, comprising the Museum and activity rooms for talks and Buddhist education. The Museum houses 100 Buddha statues, with 43 hand-copied Dun Huang Sutra exhibited by rotation. The Buddhist relics are either donated by Mr Li personally to the Foundation, or directly acquired by the Foundation. They will be kept permanently for exhibition in the Museum and open to the public for free visits. How did Mr Li select the collection? Tsz Shan Monastery formed a selection committee of local and foreign experts in Buddhist culture to advise Mr Li in selecting the exhibits. The relics selected feature the three major Buddhist traditions (Chinese Han Buddhism, Tibetan Buddhism and Mahayana Buddhism) and its installations explore and inform how Buddhism integrates and with different cultures. 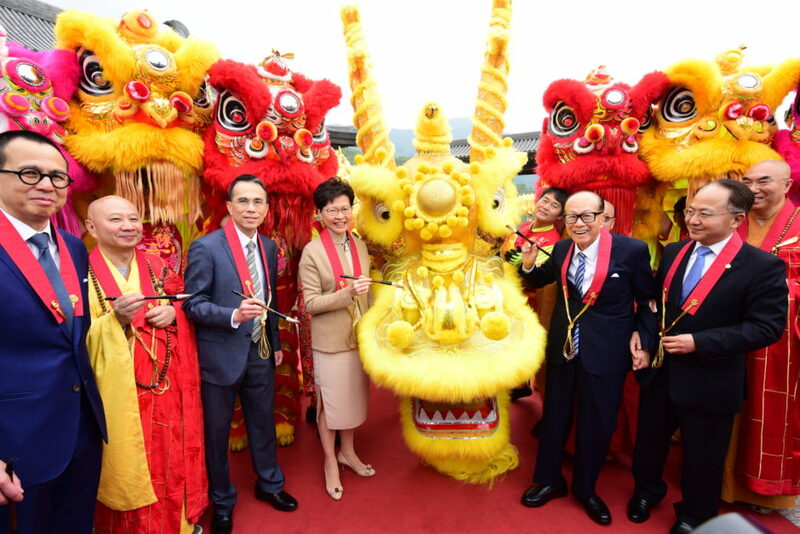 The Li Ka Shing Foundation was established in 1980 to work on education, medical services and research initiatives. 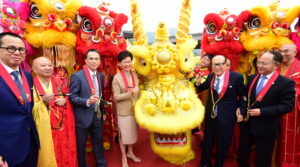 To date, Mr Li has invested over HK$25 billion across 27 countries and regions, with about 80% of the projects within the Greater China region. In 2006, Mr Li described his philanthropic effort as akin to having another son in the family. He called for a paradigm shift in our Asian culture of giving, through apportioning more of our wealth and means towards social capital so that we could bring forth great hope and promises for the future.